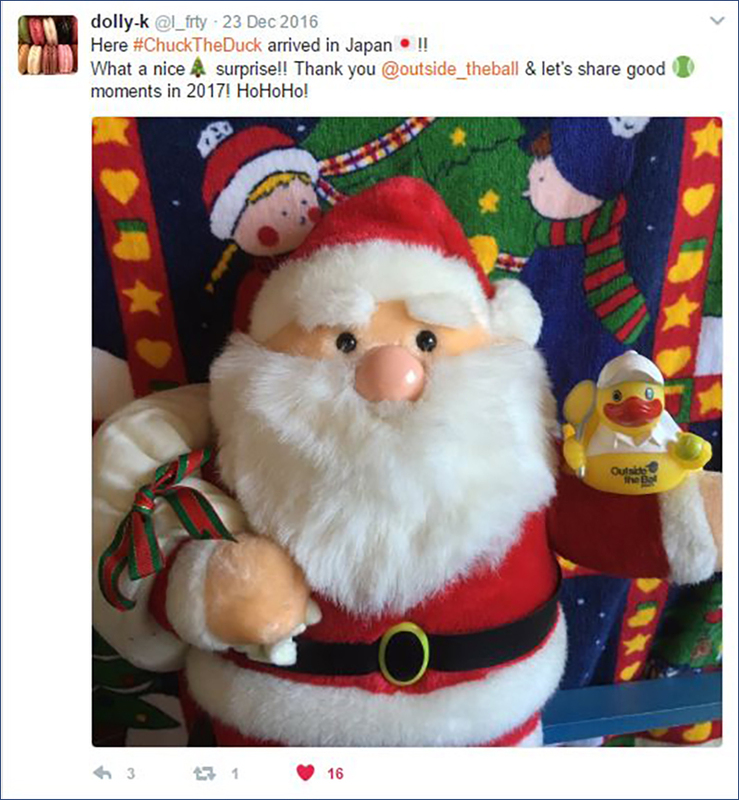 #ChuckTheDuck was a nice holiday surprise for 2 special tennis fans in Japan and Australia who shared these hilarious Santa themed photos with us. 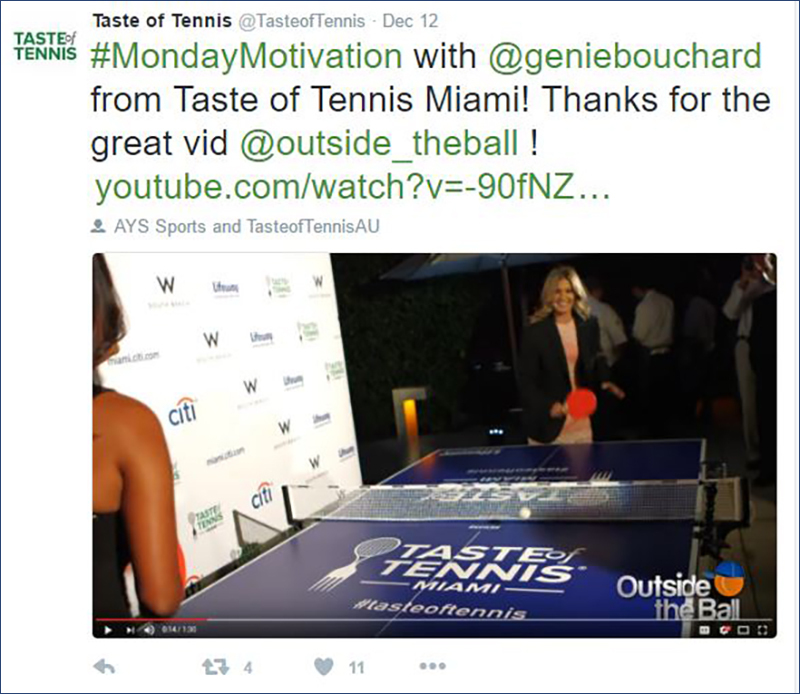 We had a great time watching the intense ping pong match between Genie Bouchard and Heidi El Tabakh and Taste of Tennis tweeted our video to their 11,300+ followers. Click to watch Genie Bouchard take on Heidi El Tabakh in a competitive game of table tennis. 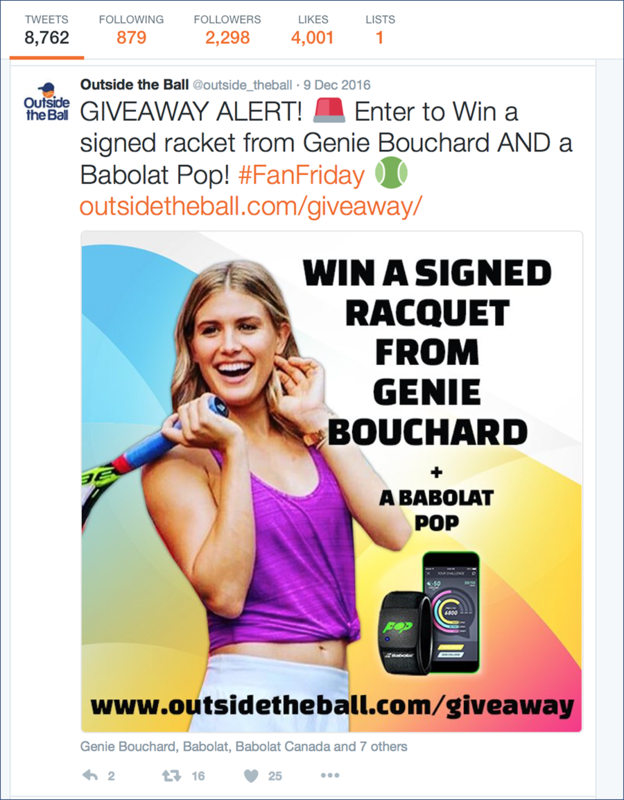 Outside the Ball teamed up with Babolat for our Genie Bouchard Signed Racquet and Babolat POP giveaway and Genie and Babolat both liked and shared the post. 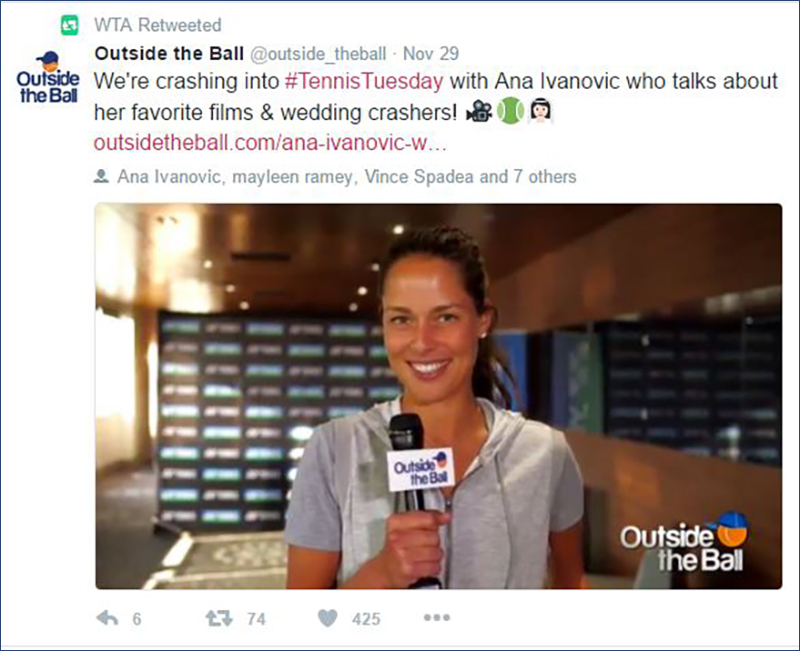 Ana Ivanovic talked to Outside the Ball correspondent Vince Spadea about her favorite films and wedding crashers and the WTA retweeted it to their 562,000+ followers. Click to watch and get to know Ana Ivanovic better off the tennis court and find out what her favorite movie is. 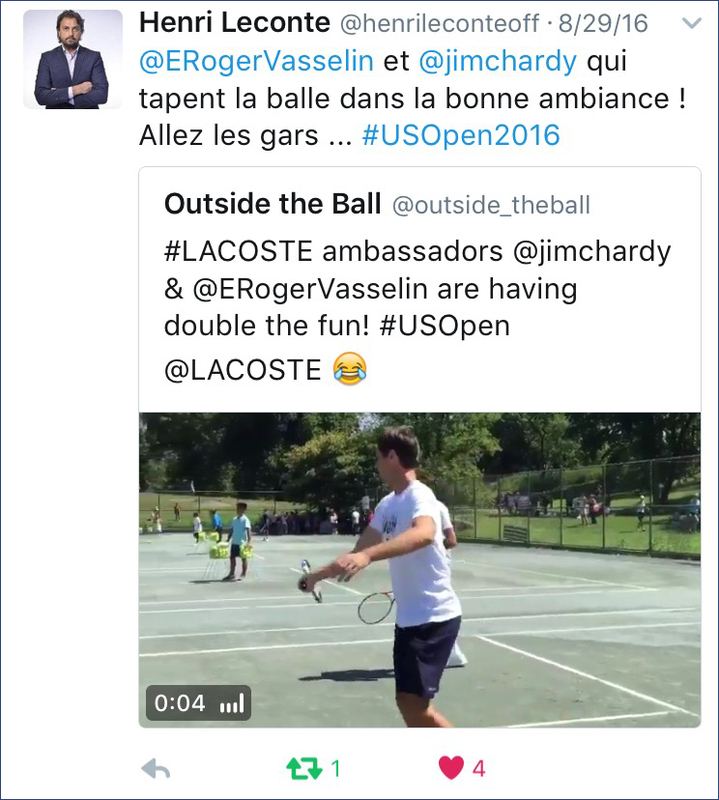 Jamie Murray and Bruno Soares spoke to our host Mayleen Ramey about the differences and similarities between tennis and padel and Tennis.com shared it on their Baseline website and tweeted it to their 177,000+ followers. 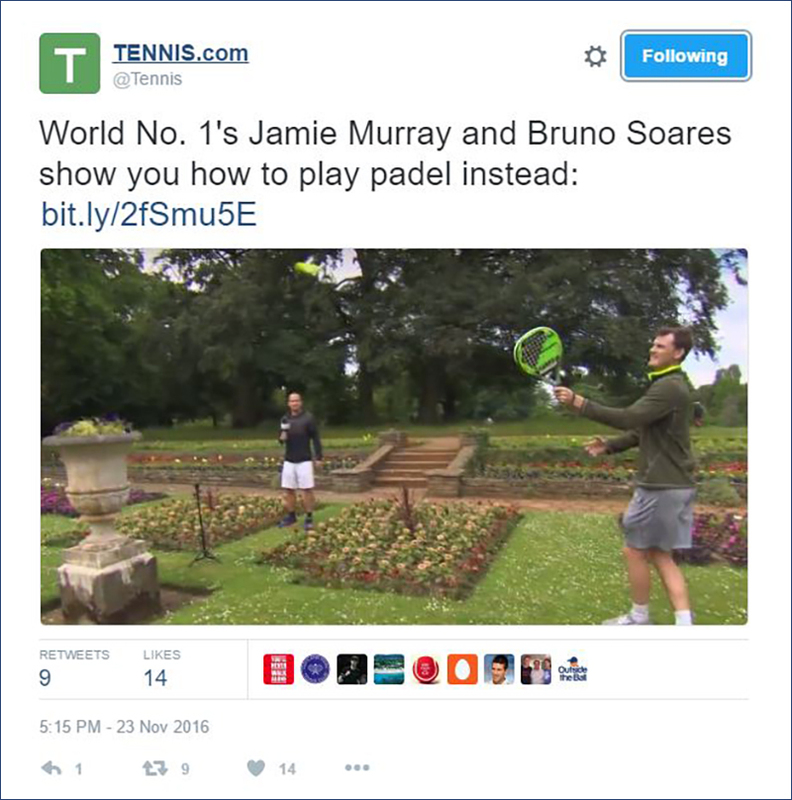 Click to watch Jamie Murray and Bruno Soares show us how to play Padel. 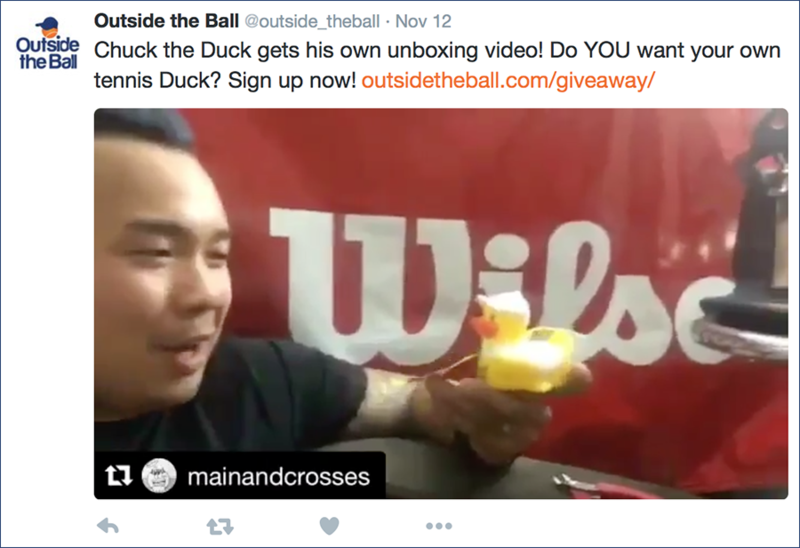 Our mascot #ChuckTheDuck starred in his own unboxing video that was produced by one of our lucky fans who entered the #ChuckTheDuck giveaway. 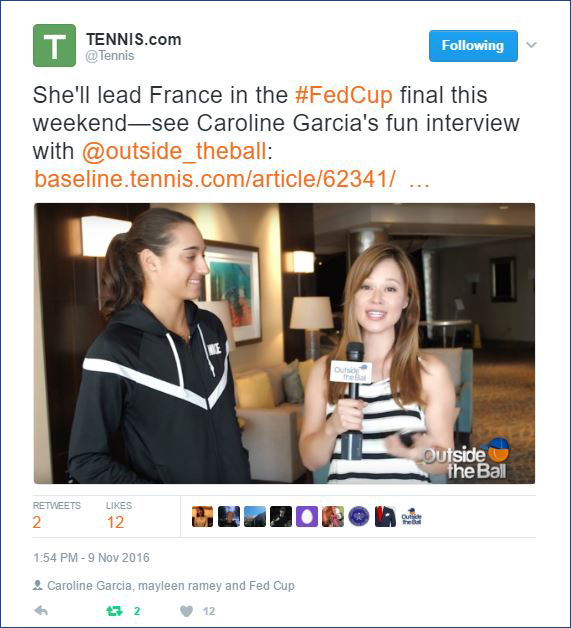 Caroline Garcia made her Outside the Ball debut in this lighthearted interview where we learn more about the French tennis star and Tennis.com shared it with their 177,000 Twitter followers. Click to watch this fun interview with Caroline Garcia talking about her favorite nicknames and what she likes to do for fun. Outside the Ball joined Spanish tennis star, Garbiñe Muguruza, to talk about her personal app launch and what makes the app so special and Tennis.com shared the video on their Baseline website. Click to watch Garbiñe Muguruza talk about her personal app launch. 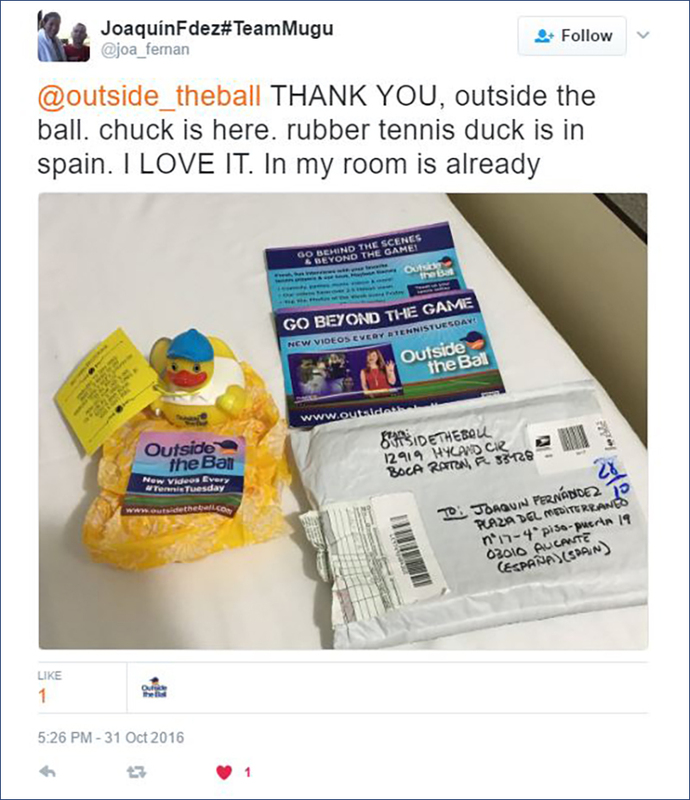 We gave our fans a chance to get their own #ChucktheDuck and one tennis fan in Spain sent us this photo of Chuck in his new home. Everyone loves a good meme and Alexander Zverev admits he's seen some pretty good memes of himself. We created 3 memes for Alexander and asked him to choose which meme he likes best. 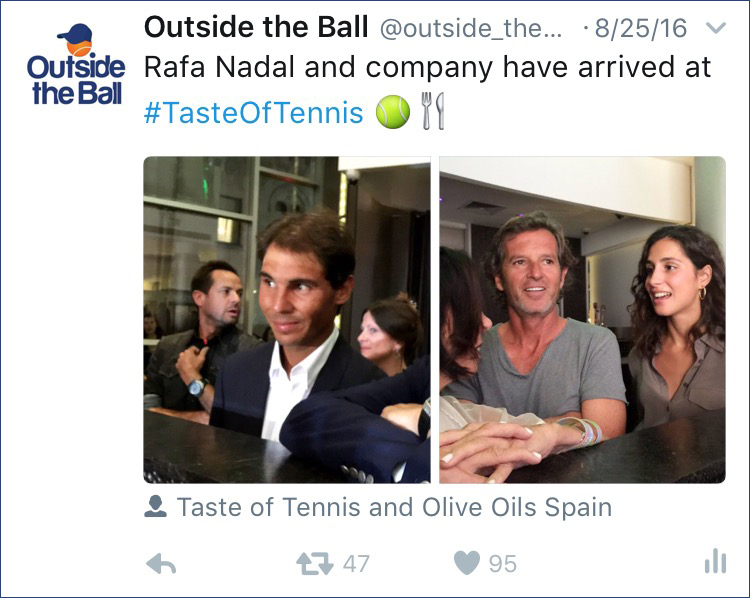 Tennis.com shared the video on their Baseline website. 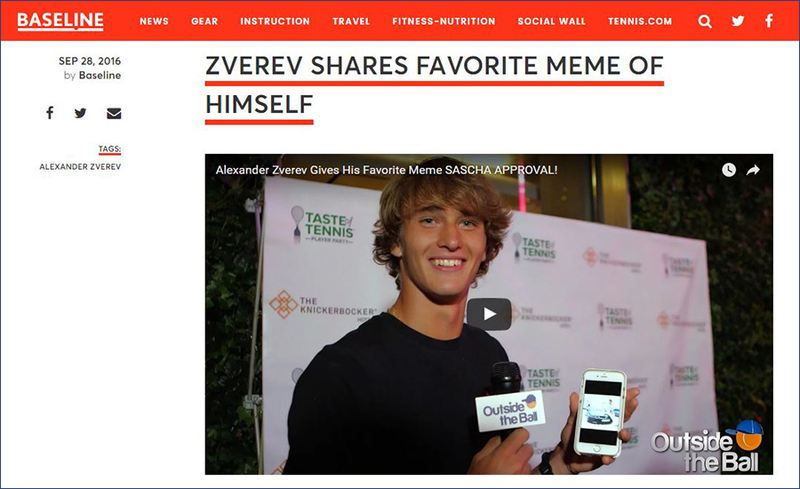 Click to watch Alexander Zverev give his favorite meme his approval. 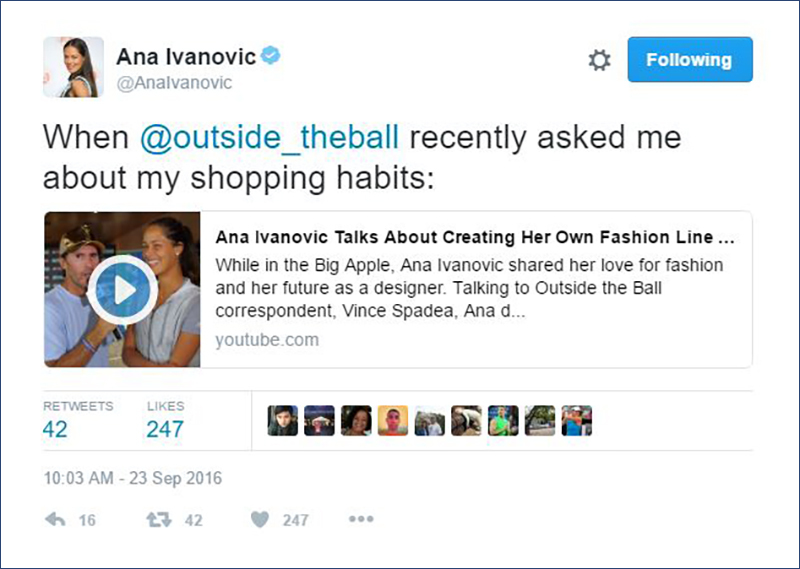 Ana Ivanovic shared her love for fashion with us and told us why New York City is the best place to satisfy any shopaholic’s need for great designs. She also talked to us about the possibility of her future as a fashion designer and shared our video with her 1.3 Million+ followers. Click to watch Ana Ivanovic share her love for fashion and her future as a designer. 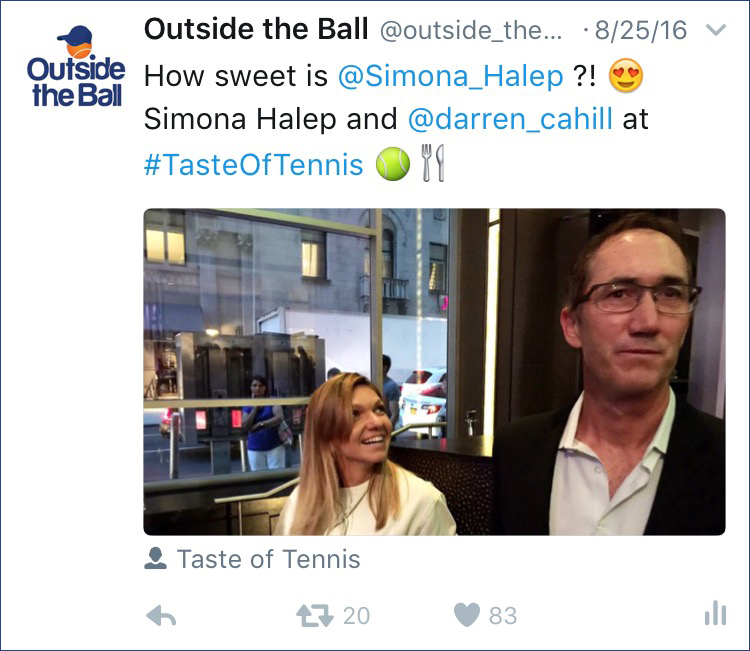 Outside the Ball joined a few of your favorite tennis stars for a tour of the Big Apple. We went on a horse-drawn carriage ride with Petra Kvitova, met up with Ana Ivanovic to help us decipher which food options are a Grand Slam and joined Tomas Berdych and his wife Ester on a Manhattan rooftop to discuss the game of love. 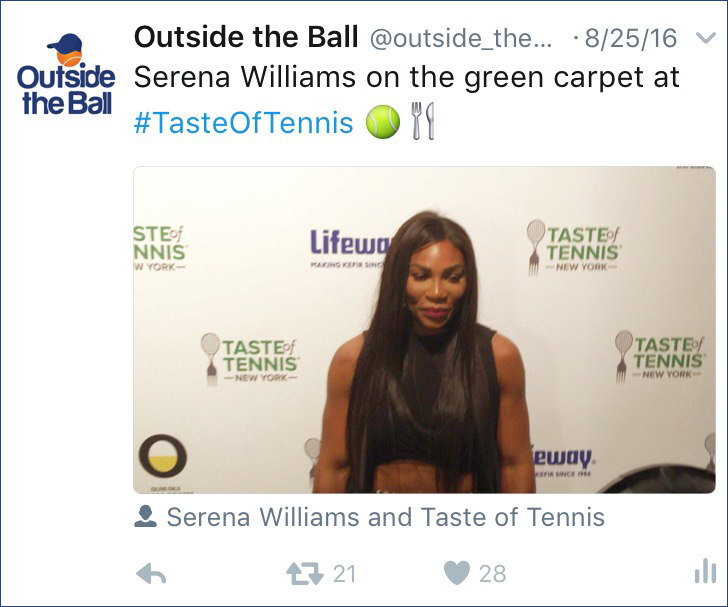 Tennis.com shared it to all of their Twitter followers and it was featured on the Baseline website. Click to watch a packed day of fun New York activities with Ana Ivanovic, Petra Kvitova and Tomas Berdych. What's the Next Best Thing to Going to London for The Championships? Finding a box of souvenirs and gear from the London Championships on Your Doorstep! 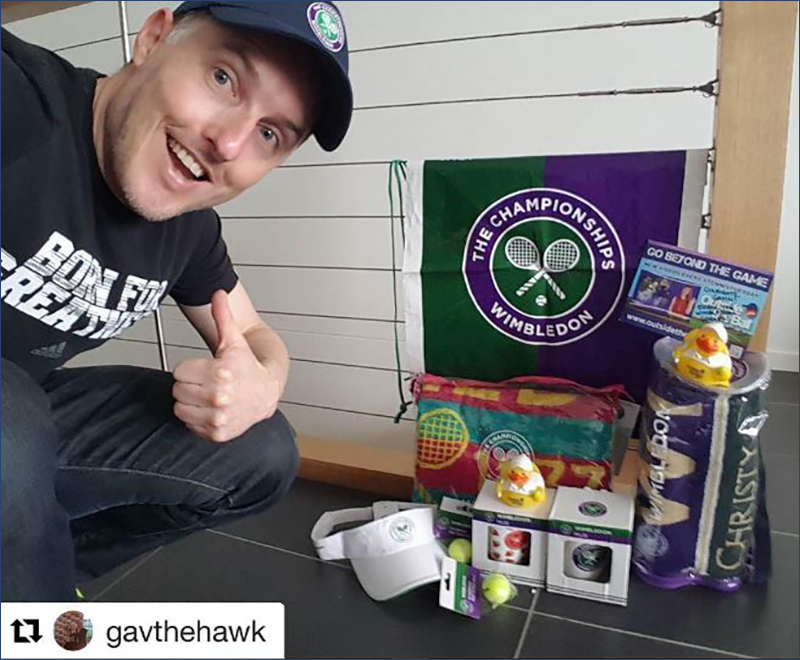 Gav the Hawk was the lucky winner of our Win Tennis Souvenirs from London Giveaway and shared this awesome photo on our Instagram page. 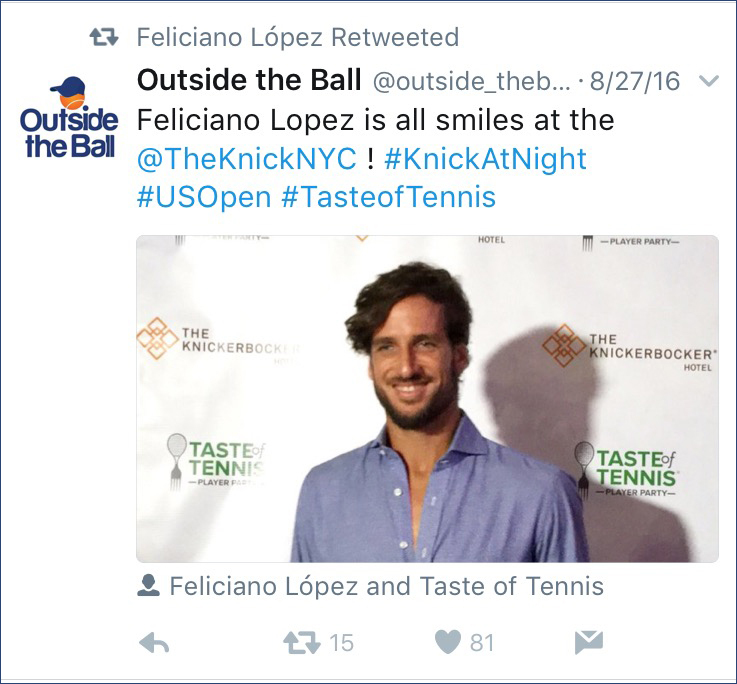 Outside the Ball's live coverage of the Taste of Tennis NY was liked by Serena Williams, retweeted by Feliciano Lopez and Heather Watson and shared by tennis fans across the globe. 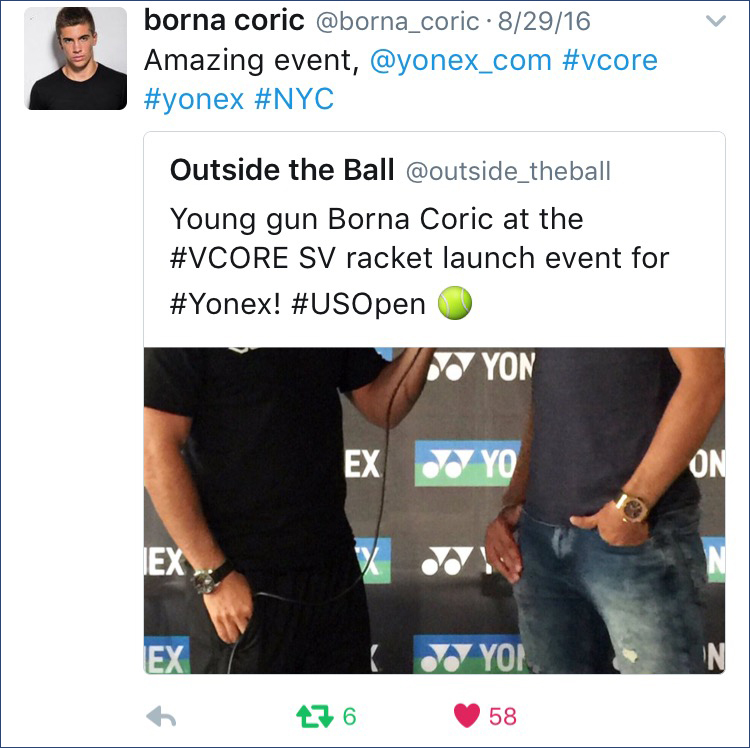 Outside the Ball's live coverage of the Yonex VCore SV Racquet Launch Event in NYC was retweeted by tennis pros including Nicholas Kyrgios (206,000+ followers) and Borna Coric (16,400+ followers). 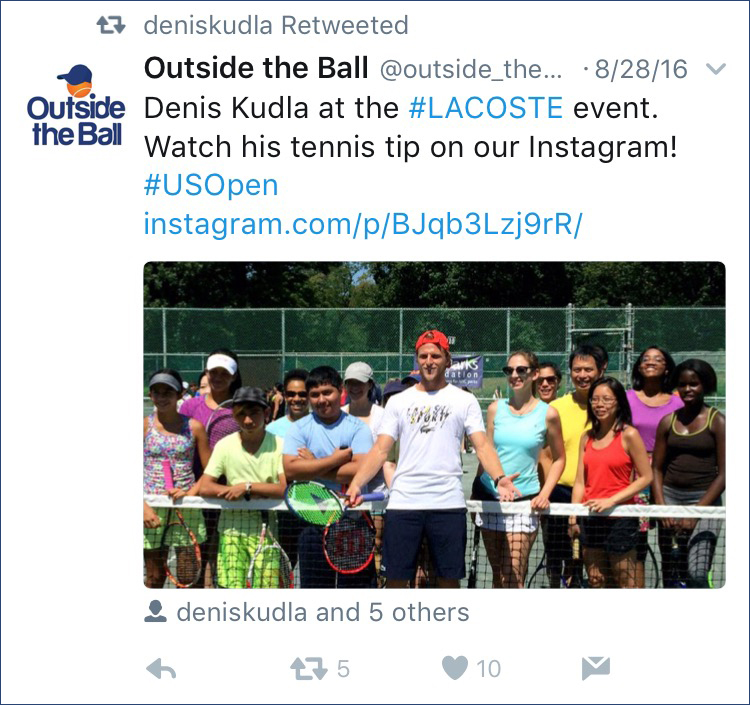 Outside the Ball's live coverage at the US Open Lacoste event was a great success and retweeted by Denis Kudla and Henri Leconte. We had so much fun hanging out with Ana Ivanovic for our unique on fleek American slang lesson and Ana tweeted about it to her 1.3 Million followers. 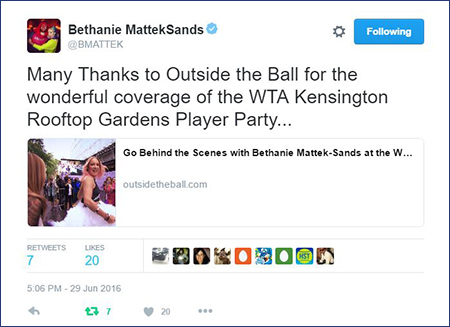 The WTA named Outside the Ball the Official Media Partner of the WTA Pre-Wimbledon Party and announced it to their 456,000 Twitter followers. 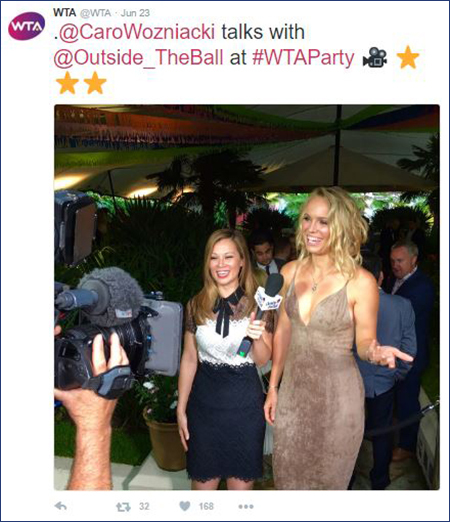 We had a fun time talking to Caroline Wozniacki at the WTA Pre-Wimbledon Party where Caroline told us she didn't have a dress ready until the day before the party. 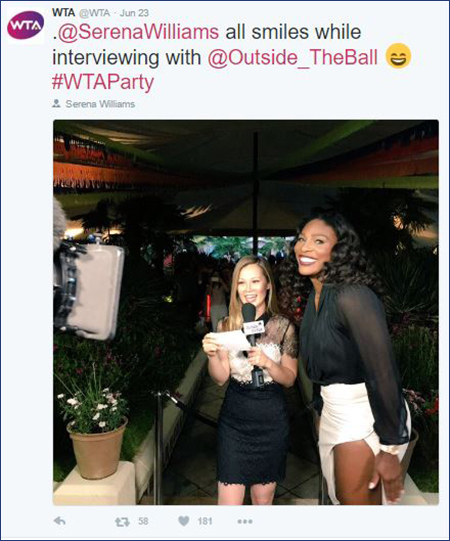 The WTA shared a photo of the interview with their 456,000 Twitter followers. Serena took the stage to prove her love of lyrics and played a karaoke pop quiz with us. Serena got every answer right and we named her the official Karaoke Queen. 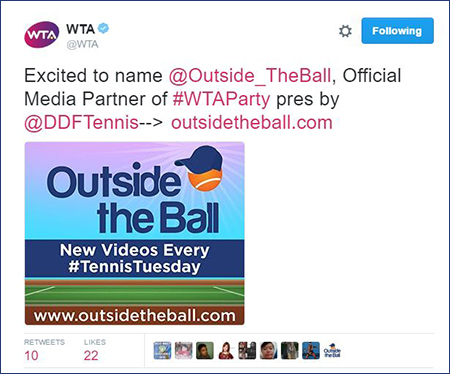 The WTA tweeted about it to their 456,000 followers. 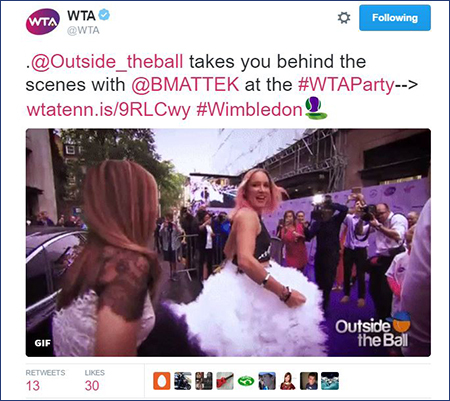 Outside the Ball was the exclusive media partner for the WTA Pre-Wimbledon Party and we got to go behind the scenes and walk the red carpet with the WTA and Bethanie Mattek-Sands. 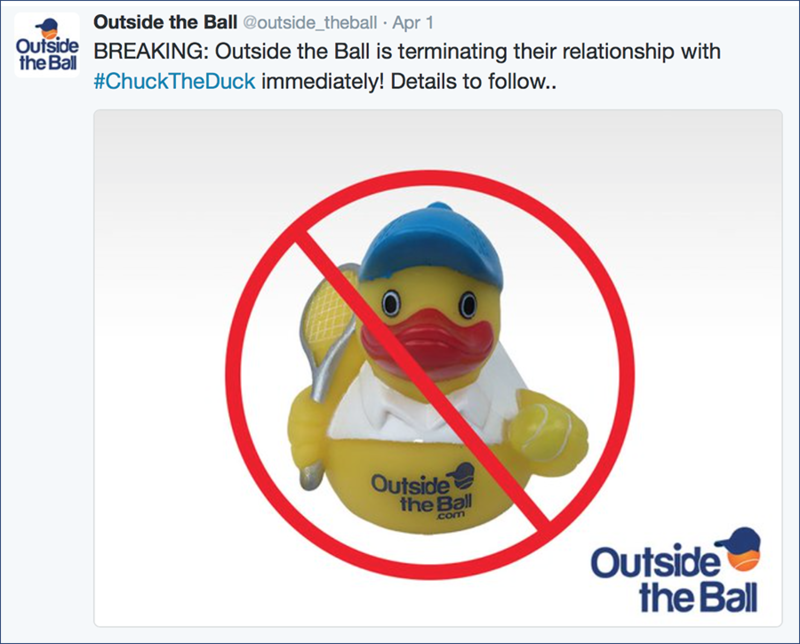 The WTA tweeted about it to their 456,000 followers. 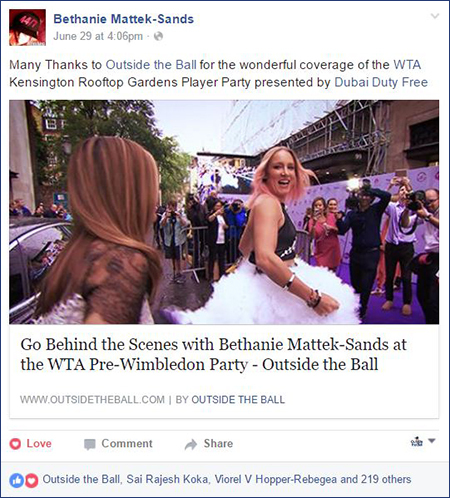 Outside the Ball got to hang out with the fashionably-fun Bethanie Mattek-Sands at the WTA Pre-Wimbledon Party and talk about her dress. 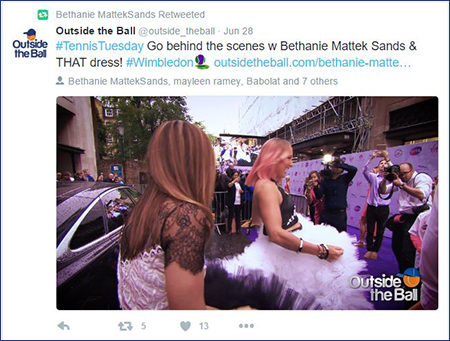 Bethanie told us that she felt like she was getting married in that dress and retweeted our posts to her 43,000 Twitter followers and shared it with her 35,000 Facebook fans. We had a great time hanging out with Timea Bacsinszky and the WTA at the WTA Pre-Wimbledon Party and Timea Bacsinszky looked gorgeous as always. 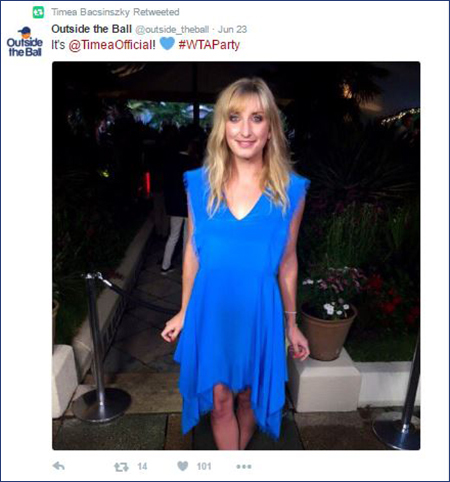 Timea retweeted this beautiful photo to her 26,000 Twitter fans. 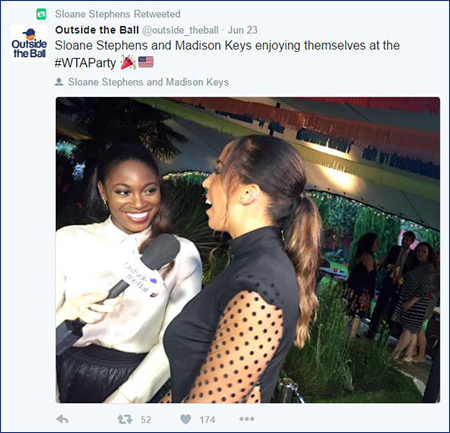 We enjoyed hanging out with Sloane Stephens and Madison Keys at the WTA Pre-Wimbledon Party. Both ladies looked super stylish and were having a great time at the event. Sloan Stephens shared our photo of the lovely ladies with her 105,000 Twitter followers. 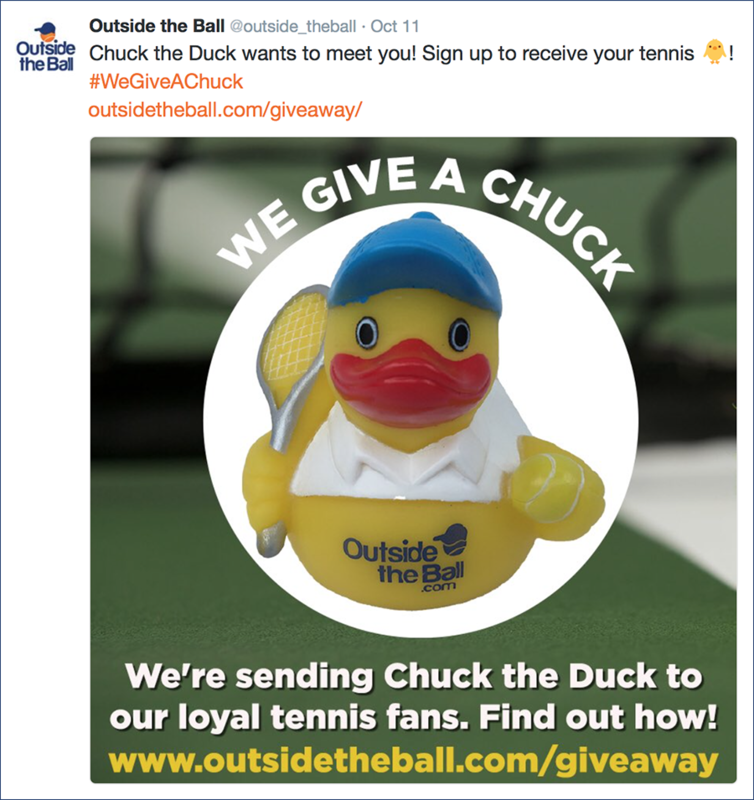 Our faithful mascot, Chuck the Duck, put his feathers on the line as he joined Grigor Dimitrov for target practice and Sportal.bg shared the video on their website. 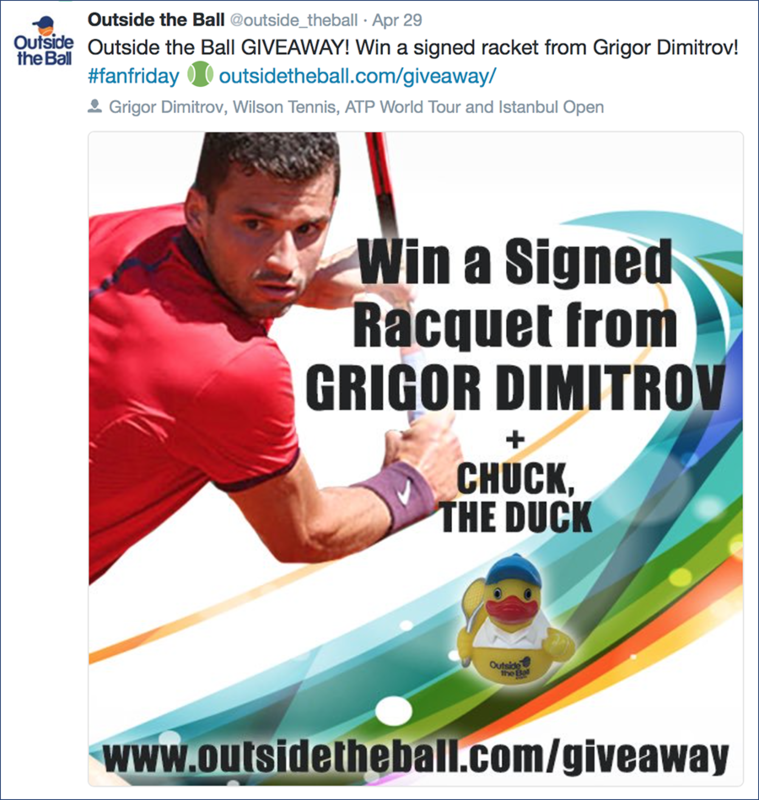 Click to watch Chuck the Duck take one for the team when he came face to beak with the Bulgarian’s powerful serve. 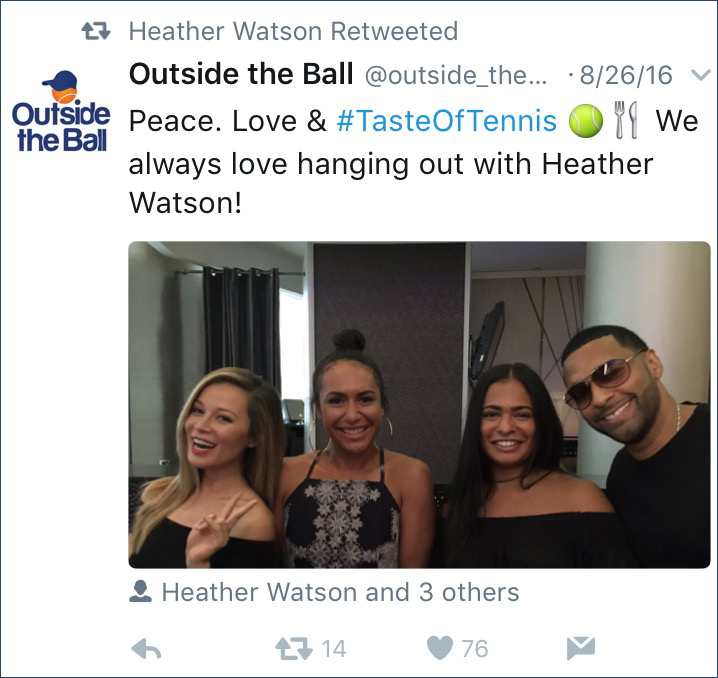 Outside the Ball partnered with Grigor Dimitrov and Wilson Tennis to gave away a signed racquet from the Bulgarian tennis player. 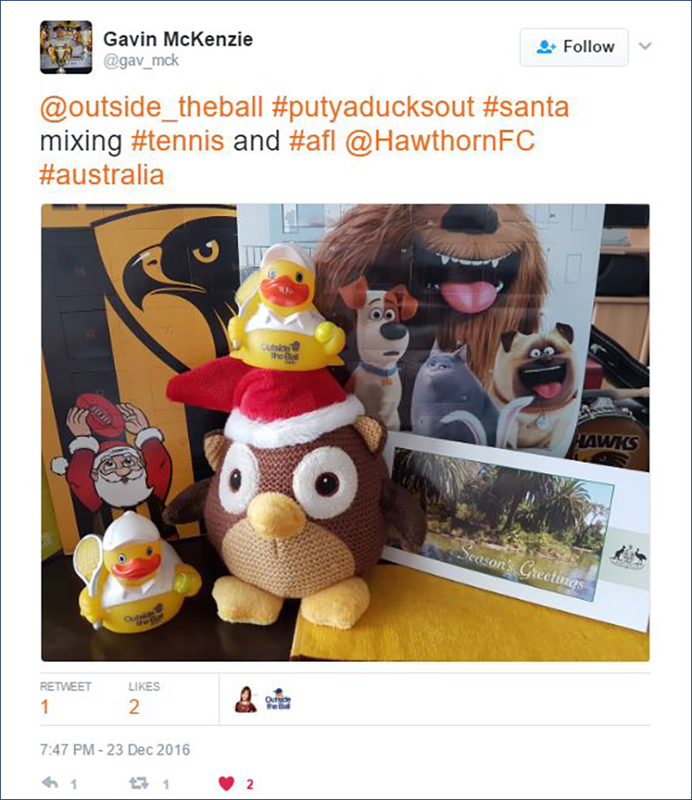 The contest was a huge hit on the website and tennis fans from around the world entered the contest and shared it on their social media pages. 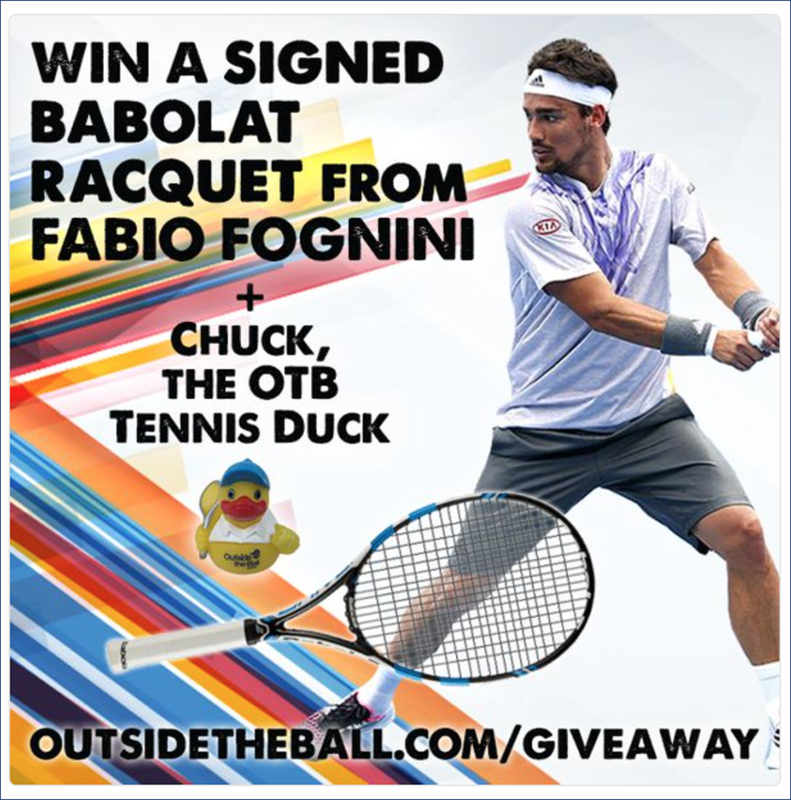 Outside the Ball gave away a signed racquet from Italian tennis pro Fabio Fognini and tennis fans across the globe entered the contest and shared it with their friends. But it's only an April Fools joke. 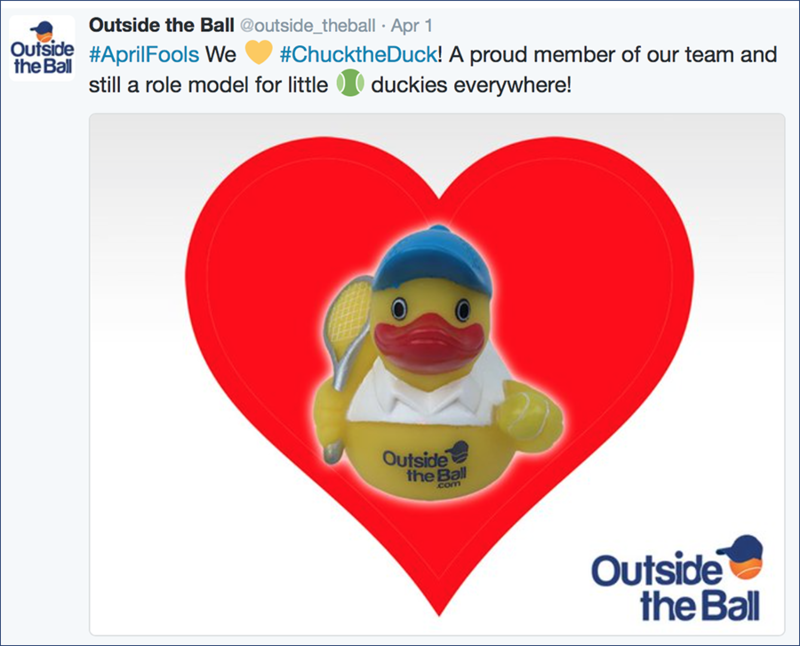 We love #ChucktheDuck and so do our fans who shared the posts with their followers and tennis friends. We gave Belinda Bencic, Victoria Azarenka, Lucie Safarova, Sam Querrey, Kiki Mladenovic and Heidi El Tabakh a smell test to see if they could guess some mystery food and tennis items just by smelling them. 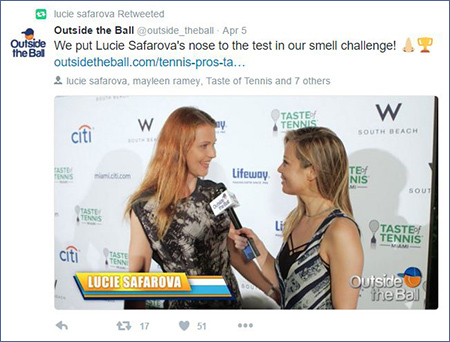 We sense this video is a big hit because it received over 30,000 views in one week and Lucie Safarova retweeted our post to her 36,000+ followers. Click to watch Lucie Safarova take the small test. 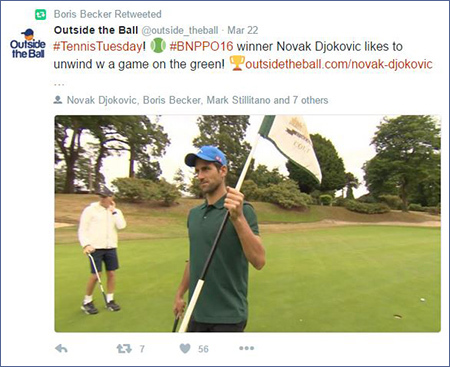 Novak Djokovic and Boris Becker took some time off to play a round of golf and Outside the Ball was there to film it. 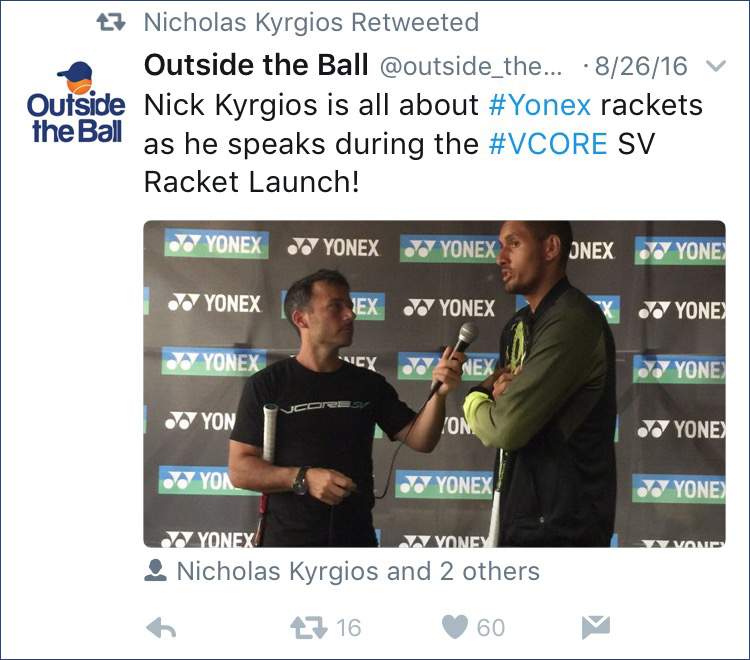 Our Djokovic golfing video received over 18,000 views in three days and Boris Becker retweeted our post to his 600,000+ followers. Click to watch Djokovic and his squad hit the green. We had a blast reading some tasty food related pick-up lines with Genie Bouchard and Genie tweets to her 618,000+ Twitter fans that she may actually use one of our pick up lines one day. The video received over 40,000 views in one week and now Genie's fans know some new pick up lines. Click to watch Genie Bouchard reading her favorite pick up lines.